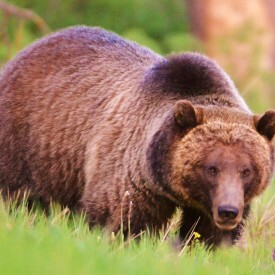 One of the more exciting animals to see in Yellowstone and Grand Teton National Park is a grizzly bear! 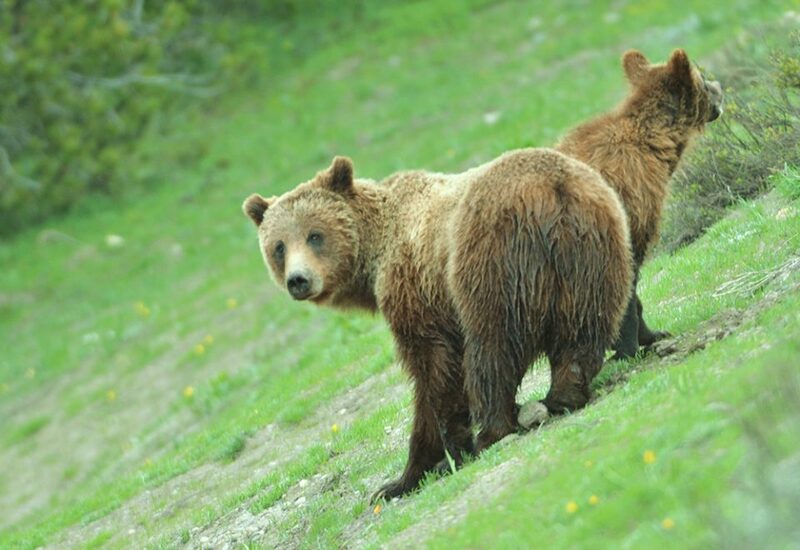 These large, cinnamon brown bears most recognizable by the large hump between their shoulders are thrilling, amazing, and are best seen from the safety of a car! But where can I see a grizzly bear? Well, if you haven’t guessed it by the timing of this article, it’s RIGHT NOW! Grizzlies have just emerged from their dens in search of food with their cubs. In fact, Grizzly 610 has already encouraged her two two-year-old cubs to move out and is currently being wooed by some good looking gents, Brutus and Bruno. After spending the cold winter in a favorite den resting, bears start to get hungry around the end of March and beginning of April. They will eat just about anything, including frozen remains and last year’s vegetation. When they come out of their den, of course, depends on whether they have cubs in tow. Mothers who have a couple of little ones might take longer than their male friends. 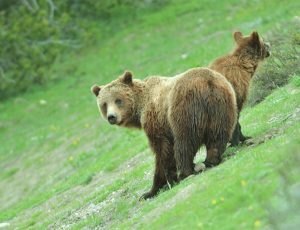 As of right now, the bears known as Grizzly 399 and Blondie have not yet been spotted with their COY (cubs of the year). Everyone is eager to find out how many cubs each will have! In general, you can spot grizzlies in the area around Jackson Lake Lodge (we can’t give away all of our secrets!) and in the Hayden and Lamar valleys of Yellowstone. We can tell you that just yesterday, a big male Grizzly was sighted in the John D. Rockefeller Jr. Memorial Parkway swimming across the Snake River. At this time of year, it is especially important to be BEAR AWARE! Carry bear spray during any activity as you never know where they are going to show up! This entry was posted in Field Notes on May 16, 2017 by gliffen. Where and What are Ermine in Jackson Hole? Bear Witness Safari Company is an authorized permittee of the Yellowstone National Park and Grand Teton National Park.